Why Should You Attend the 2010 Sensors Expo & Conference? Register Today at www.sensorsexpo.com to secure Early Bird pricing! PLUS - REGISTER with source code: F310H + save an EXTRA $50 off Gold + Main Conference Passes! Jump start your sensor-related education with a deep dive into your choice of advanced sensing technology topics in day-long Pre-conference Symposia on Monday, June 7! Symposium 3: Power Management: Energy Harvesting & Storage: Randy Frank, President, Randy Frank & Associates, Ltd.
BEST VALUE! Register for a Gold Conference Pass and Your Symposia is included! 2010 Sensors Expo & Conference Scholarship Program: It's never been more affordable to get the knowledge and education you need! 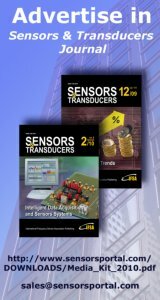 REGISTER at www.sensorsexpo.com FOR A GOLD OR MAIN CONFERENCE PASS, using code: F310H + SAVE $50! REGISTER in Advance for a FREE Expo Pass & Gain Access to ALL of the Above! Sensors Expo & Conference is a division of Questex Media Group LLC. Questex Media Group headquarters is located at 275 Grove St, Suite 2-130, Newton, MA. 02466. © 2010 Questex Media Group LLC. All Rights Reserved. PCB Load & Torque, Inc. has aggressively lowered the price of their high-quality low profile, rod end style, and S-Type load cell sensors and at the same time improved their stock program designed to provide customers immediate delivery, thus creating the best overall value for customers. Market- and performance-proven, PCB® Series 1200 Low Profile, Series 1400 Fatigue-Rated Low Profile, and Series 1300 Rod End Load Cells are rugged sensors utilized in the automotive, aerospace, industrial, and commercial product industries. PCB® Series 1400 Fatigue-Rated Low Profile Load Cells are manufactured using premium heat-treated, fatigue-resistant steels and are ideal for system or component durability testing, performance evaluations, or structural testing. PCB® Series 1200 and 1300 general purpose load cells are suitable for a wide range of tension and compression measurement applications including component testing, quality control and material testing. The high accuracy of our S-Type Load Cells makes them ideally suited for critical weighing applications. PCB® stocking program allows these popular products to be stocked and ready to ship to ensure customers receive fast delivery on every order. Quality products, lower prices and faster lead times, coupled with the PCB® Total Customer Satisfaction Guarantee, equals the best value in the industry. 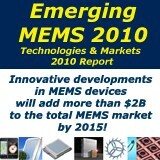 Why another MEMS market report ? MEMS markets have been and will always be driven by innovation. It means that, every year, new MEMS developments are coming out. Not all of them find commercial success, but the constant stream shows there are plenty of applications where MEMS devices could be used. For a long time, the MEMS market has been composed of “mature” MEMS devices: IJ heads, pressure sensors, accelerometers and DMD. Then came microfluidics, gyroscopes, micro phones, RF MEMS (the latter still struggling to shift to large volume). In addition to these devices, there are a lot of new MEMS that have crossed the gap from R&D to commercialization, or are close to doing so. This report presents these new “Emerging MEMS” devices that could be the next killer application of tomorrow. An interesting fact is that most of the new MEMS developments are under the roof of startups. The situation is quite similar to what happened in the 1998-1999 period, when many new MEMS developments were on the edge of crossing the chasm - today these are mature MEMS products with large volume markets. We have identified more than 30 startups involved in new developments. These new companies will contribute a major part of the Emerging MEMS market devices by 2015 (10% of the total MEMS market)! Among the MEMS devices analyzed in this report, microbolometers, digital compasses & oscillators will represent the most promising markets. Out of these 3, only microbolometers are mature technologies (while still subject to innovations to lower cost and increase integration). MEMS oscillators are now ready to take a significant share of the timing market. Digital compass is a soaring market in 2010 that started in earnest in 2007 thanks to the first monolithic 3-axis devices. Micro displays are a more risky technology as the technology is not mature yet. But CA GR will be very high. Micro fuel cells have large market expectation as MEMS based microfuel cell market is expected to take about 25% of the global microfuel cell market. Other emerging MEMS will still represent a major market value in 2015. They are micro tips and micro probes. Auto focus is today shifting from AF lens to an integrated OIS solution for camera modules with gyroscopes. This could boost the gyroscope market as soon as 2010. Finally, considered as Emerging MEMS technologies and covered in our report, other applications are really at the start of the learning curve or will stay niche applications. They are micro structures for watches, RFID, Energy harvesting and Micro speakers (with the latter showing promise for a volume market by 2015). overview, market dynamics, technologies, players, technical trends and market shares are described. 2. Market data on new MEMS developments. Each Emerging MEMS has been quantified in market value and units for 2009 through 2015. 3. An identification of new MEMS companies that could contribute to the MEMS market growth in the future. 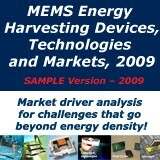 To understand the potential of new MEMS devices.